The story of Matthew Lyon focused national political attention on the newborn state of Vermont and offers a good illustration of the intensity of political strife in the 1790s. Like many of his friends, Lyon began to buy land at bargain prices in the north. He chose a tract of land in Wallingford, which at the time consisted of only “a few rough log huts scattered in the surrounding woods.” During the Revolution, Lyon joined the Green Mountain Boys. He participated in the capture of Fort Ticonderoga in 1775 and the Battle of Hubbardton in 1777. Lyon’s first wife died shortly after the war, and he married one of Governor Chittenden’s daughters. Shortly thereafter, Lyon founded the town of Fair Haven, establishing the first store, the first hotel, a paper mill, gristmill, two forges, an iron furnace, and a newspaper. He twice represented Fair Haven in the General Assembly. Lyon was elected to Congress in 1796. He gained national attention by getting into a fight with Congressman Griswold of Connecticut. Representative Griswold suggested to Lyon that he had been less than patriotic during the Revolutionary War and Lyon spit into his face. 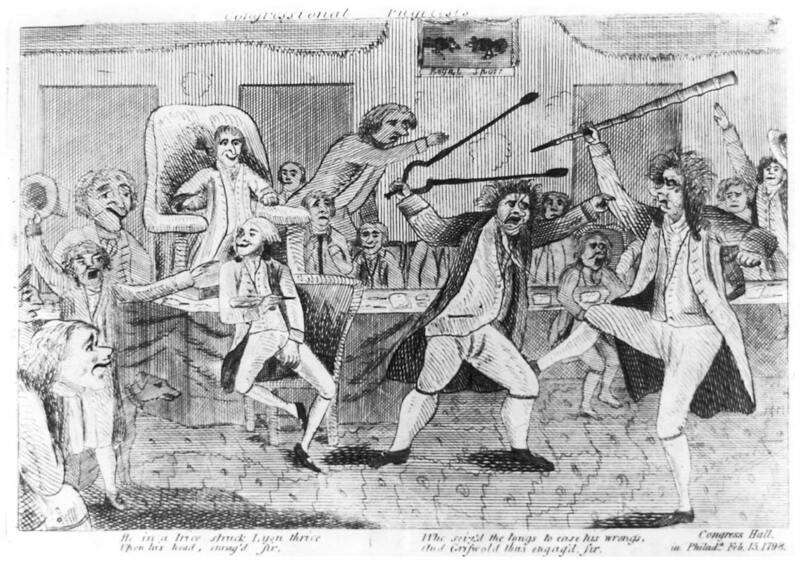 They dueled on the floor of Congress, one with a poker and the other with fire tongs. Congress attempted to expel Lyon, but a two-thirds vote was not achieved. In 1798, Lyon wrote a letter criticizing President Adams, calling him a “pompous fool.” Congress had just enacted the alien and sedition laws. He was convicted of sedition in a Rutland court, put into jail in Vergennes, and fined $1,000. While in jail, he was re-elected to Congress. A few years later, he moved to Kentucky, became a merchant and ship builder, and established a printing press. He was beset by financial difficulties and lost virtually all his property. In 1820, he was appointed as an Indian agent in the territory of Arkansas. In a very short time, he was elected to Congress, but shortly thereafter, he died before he could take his seat. Senator Bill Doyle serves on the Senate Education Committee and Senate Economic Affairs Committee, and is the Senate Assistant Minority Leader. He teaches government history at Johnson State College. He can be reached at 186 Murray Road, Montpelier, VT 05602; e-mail wdoyle@leg.state.vt.us; or call 223-2851.